The European Journal of Palliative Care (EJPC) was established in 1994 to provide an information and communication resource for all professionals involved in the provision of palliative care across Europe. The EJPC is an official journal of the European Association for Palliative Care (EAPC) and, as such, serves to keep members and non-members alike up to date on the key activities, goals and strategic direction of the EAPC. The EJPC publishes mainly review articles related to the ever-increasing provision of palliative care, but it also welcomes relevant original research papers where appropriate. Published bimonthly, it is designed to be of direct and practical relevance to the diverse range of individuals involved in palliative care. The journal aims to help them develop their skills and broaden their knowledge base by covering all aspects of the care of patients suffering from advanced, incurable disease. 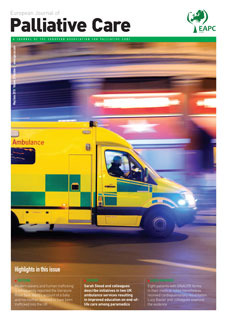 The current issue is available in print, as an online edition and as a PDF to download and view on your computer, tablet or smartphone. The data, opinions and statements appearing in the articles herein are those of the contributor(s) concerned; they are not necessarily endorsed by the Publisher, Editors or Editorial Board. Accordingly, the Publisher, Editors and Editorial Board and their respective employees, officers and agents accept no liability for the consequences of any such inaccurate or misleading data, opinion or statement. The European Journal of Palliative Care is abstracted/indexed in the Cumulative Index to Nursing and Allied Health Literature (CINAHL) and Scopus.